The 2017 Honda HR-V is in stock now here at Brilliance Honda of Crystal Lake. If you’re shopping for a small crossover SUV that provides upscale features at an affordable price, then consider the HR-V EX trim level. This version adds on some key features that many Chicago area drivers will no doubt appreciate. Find out more here at Brilliance Honda of Crystal Lake. Every Honda HR-V gets a 1.8L four-cylinder engine good for 141 hp and 127 lb-ft of torque. The EX trim is offered with either a six-speed manual or a continuously variable transmission. You can choose either front-wheel drive for more efficiency, or all-wheel drive for more all-season capability. Either way, the Honda HR-V offers the efficiency you’ve come to expect from Honda. The EPA estimates that the HR-V EX with front-wheel drive and continuously variable transmission can achieve up to 28 mpg city/34 mpg highway/31 mpg combined*. All-wheel drive and CVT drops the EPA estimate to 27 mpg city/31 mpg highway/29 mpg combined with continuously variable transmission*. The Honda HR-V EX trim upgrades the vehicle’s safety with the Honda LaneWatch blind spot monitoring system. It also gets all other standard safety equipment, including a multi-angle rearview camera, traction and stability control, anti-lock brakes, and multiple airbags. The 2017 Honda HR-V is in stock right now at Brilliance Honda of Crystal Lake at 680 West Terra Cotta Avenue In Crystal Lake, IL, just a short drive from Elgin. 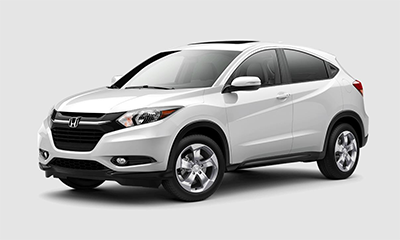 Visit us today or contact us online now with any questions about the HR-V EX trim level!